The Exascale Computing Project (ECP) Software Technology (ST) team has released version 1.5 of its Capability Assessment Report (CAR). Version 1.0 of the document was published in July of 2018. The CAR provides an overview and assessment of current ECP ST capabilities and activities, giving stakeholders and the broader high-performance computing (HPC) community information that can be used to assess ECP ST progress and plan their own efforts accordingly. 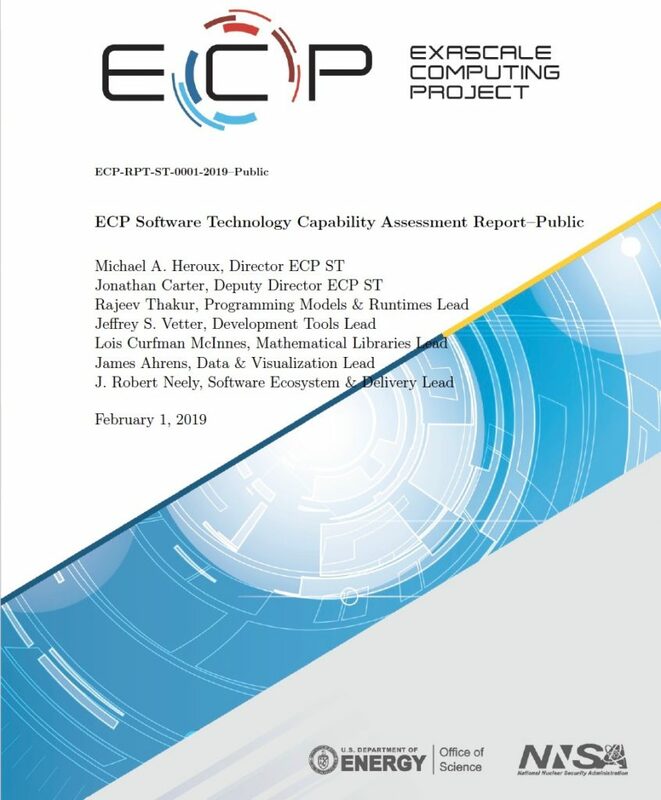 Software Technology is a research, development and delivery focus area of the ECP and represents the key bridge between exascale systems and the scientists developing applications that will run on those platforms. ECP ST is delivering the next generation of US Department of Energy (DOE) software capabilities for the coming specific exascale systems as a high-quality, sustainable product suite. The suite is delivered through the Extreme-scale Scientific Software Stack (E4S) found at https://e4s.io. E4S is a growing and self-contained scientific software distribution that consists of next-generation HPC technologies for 90 open-source scientific software products that allow DOE leadership computers to reach performance potential in preparation for exascale. E4S is architected around a growing collection of software development kits (SDKs) with turnkey installation and interoperability. Release 0.2 of E4S is available, containing 37 ECP ST products (up from 25 in the November 8, 2018, Release 0.1). ECP ST develops these products with an abiding commitment to software quality that is based on industry best practices, and with the aim of leaving a legacy upon which US security, science, industry, and technology leadership can build. Read the full ECP ST Capability Assessment Report.